Alex Watson is a sacred, jazz, and classical piano performer and recording artist. His formal music education includes graduating from UNC Chapel Hill with a Bachelor of Music Degree, international chamber music study in Switzerland, Italy, and the Netherlands, as well as a top graduating member of the United States Armed Forces School of Music in Little Creek, Virginia. Mr. Watson is a proud veteran, having served active duty in the United States Navy as a keyboard instrumentalist for authorized military bands in the southwestern US. He continues to support veteran resources by hosting benefit concerts for local nonprofit organizations such as ABCCM’s Veterans Restoration Quarters, Buncombe County Veterans Treatment Court, and CORPOINT Veterans Career Coaching Services. For more information about Alex’s most recent solo piano album release and upcoming concerts, visit www.AlexWatsonPiano.com. 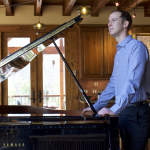 Currently, Watson is the Adult Education Coordinator and instructor at Piano Lab Studios. Alex believes that music is therapeutic and builds strong communities. His consummate facility of the instrument offers listeners with a broad pallet of musical colors and emotions. He is passionate about performance experiences being welcoming, approachable, and engaging to the listener. Mr. Watson is grateful for your support and is hopeful you will find sustained peace and love through the gift of music.